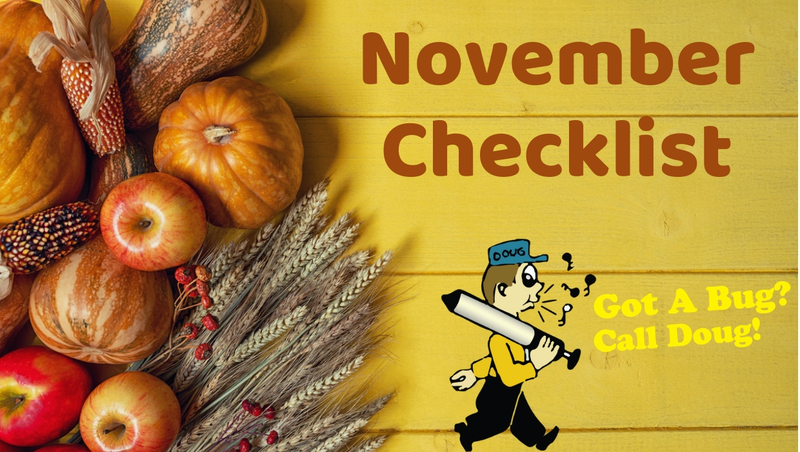 The holidays are right around the corner and to help you prepare we have your November Home Checklist! Take a walk around your house and see if you have any holes that are large enough for a mouse or unwanted pest to enter. When the weather gets cold they will be looking for a warm place to call home. Read more about Pest Control Tips for the Fall Season. Now that fall is almost over take some time and blow the last of the fallen leaves to a pile keeping your yard clean. Also take a peak at your gutters and clean if needed. Any non-migrating birds can use our help when it comes to finding food in the winter. Their water sources may freeze and wild food supply becomes scarce. Stock up on birdseed so you can keep your bird feeders full. If you have a sump pump to help protect hour home from flooding that could occur, make sure it is working properly before the rain season is in full swing. With all the family dinners and holidays parties that are to come, don’t let your dining room chairs damage your hardwood floors. Take a few minuets to replace the protector pads on the bottom of your chairs. Take a preventative measure to ensure no one will slip and fall on ice and snow. Examine your sidewalks, railing and stairs making sure they are sturdy and not uneven. If you are planning on hosting holiday parties this season, take stress off your shoulders and start decorating this month. Consider getting some of the prep work done early as well by and laundering linens ahead of time. Making time to schedule a deep cleaning of the bathrooms a week before the event will allow a quick surface cleaning before the party. You never know what the weather will hold so prepare for the cold and snowy winters. Make sure you have snow shovels, firewood, and emergency kits. Contact your Spartanburg exterminator, Gotta Bug Call Doug at (864) 582-3684 for more information on Spartanburg pest control services we provide.